A sparkline is a visual representation of a data series in only one cell, the image above shows sparklines next to each team's performance data. There are no visible axes and axes values, only columns that quickly highlights the trend, min and max values. Click on a cell where you want the sparkline. 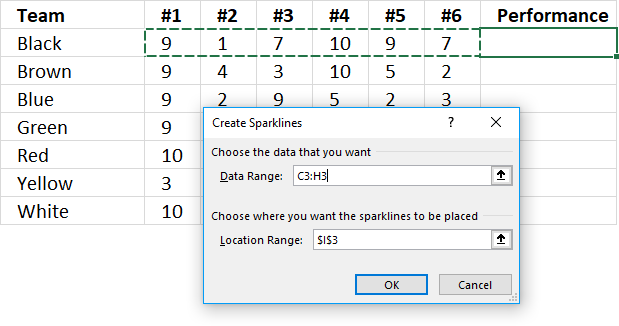 Click "Column Sparkline" button to open the "Create Sparklines" dialog box. Select the cell range that contains the data. Click and hold with left mouse button on the dot shown in above image, then drag down as far as necessary to create sparklines for each data series.